New hats, gacha, and group gift! It’s been a busy week! I’ve sculpted all new updated versions of the popular Onigiri animal hats! I did my best to keep them as true to the originals as possible, but most notably they’re sculpted, shadow mapped, and have much better colors (in my opinion, anyway!) I about drove my husband crazy asking his opinions about them every step of the way, trying to balance redesigning with the old hats in mind, retaining the cute knitted style while also keeping as many details of the actual animal as I could! It was a lot of fun, though, and I hope everyone will enjoy them! They’re 99L each and can be purchased only in-world at the moment (marketplace will still probably be a couple of days; I’m a bit exhausted!) 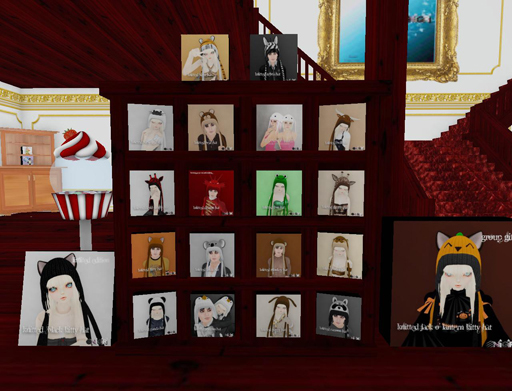 I’ve also placed them all in a gacha next to the display for 49L apiece (in case you just want one, and don’t care which, or want to take your chances. ^_^) The gacha also contains a limited edition rare black cat version for Halloween! Speaking of Halloween: I’ve also made a group gift Jack-o-lantern knitted kitty hat, available in the store until Halloween! Just wear your group tag and click the box. Finally: for whatever reason, people may have preferred the old, non-sculpted hats or missed out on picking up some particular one they had their heart set on. I’ve boxed them all up together and they’re available in the discount section for $L495, and will remain there at least for the foreseeable future. Hope all this news puts a smile on some faces. ^_^ Enjoy! I’ve been a bit more active on SL lately, and after numerous “Where’s Onigiri?” inquiries, I’ve decided to open a new location and see how it goes. Some new items will probably be out soon, as well as a gacha with some rare knitted animal hats (if you’ve got a request, feel free to make it here; I’m still debating what animals they will be!) My doll keys have been aesthetically revamped with sculpted, light-mapped keys and a menu-controlled system rather than the old voice controls. They mark the flagship products of my new line, Onigiri: Dolled Up! Stop by and check everything out! 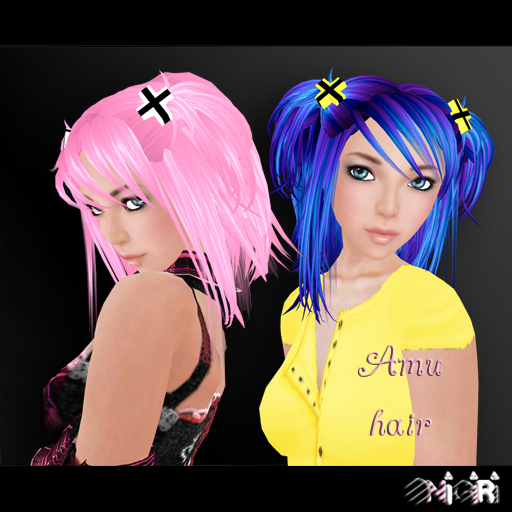 My third and final contribution to this year’s hair fair is a style inspired by Amu from the anime/manga Shugo Chara! I love her sense of style – she always has the cutest hair and clothes. In fact it was this same style that made me pick up the manga to read to start with, and I’m glad I did. The series is a lot of fun! So here’s the style – it’s my favorite of any that I have ever done. ^_^ I hope you like it, and I’ll see you on Saturday at the Hair Fair! Anyway, so I have made three hairstyles, each based on an anime/manga character, in trying to keep to Onigiri’s fandom roots. 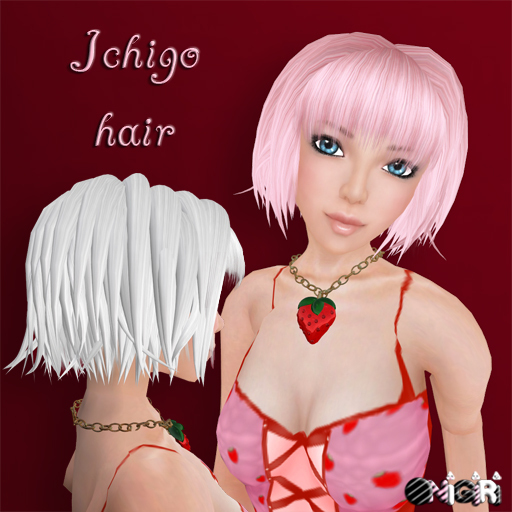 They’re adapted a bit, mostly in the bangs, so they’ll look better in SL, since generally the stringy pointed anime bangs look isn’t very flattering in SL (or RL, for that matter, haha) but I generally kept to the original character’s overall hairstyle. I will be sending out each of the three styles in the usual update group special color (a deep metallic purple called Poison) once the fair starts! 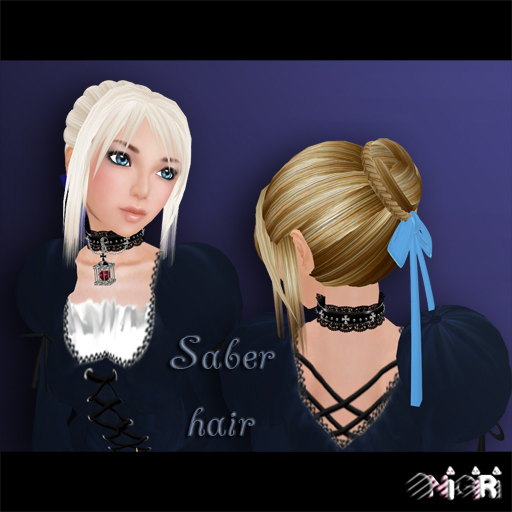 The first style is called Saber, and is based on the style worn by Saber in Fate Stay Night. This anime I haven’t actually seen, but I have had requests for it, so here it is. Enjoy. ^_^ Look for the unveiling of the next style in a few days! I released a cute new microphone yesterday that works as a typing animation overrider. 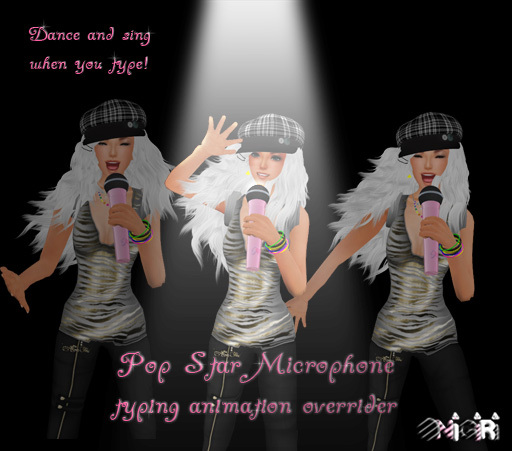 It is invisible until you type, and then you hold it up and “sing” (singing is silent) and dance like a pop star! Better than typing on the invisible air keyboard, right? ^_^ You can find it for $L100 in the New Products section at the store. Enjoy! Yes, I really did like that VIP hunt! If you haven’t done it already – it is worth the 200L and then some! Mood ring new at Onigiri! I was in the mood to make something cute and fun the other day so I made a mood ring. ^_^ It responds to what you say, with dozens of key words and emoticons and five moods at present. When you trigger a mood change, it will shift gradually to the new color over several seconds, and if you trigger a new mood before it has finished its last shift, it will stop mid-shift and shift toward the new mood, just like a real ring! It has free automatic updates, so as I come up with more moods and words, it will grow even more. :D If I’ve missed any you think should be included, give me a shout! New color-change Mary Janes at Onigiri! Last night I got the urge to make sculpted persocom (ie. Chii from Chobits) ears in SL :D Chobits was the first anime I ever sat all the way through and it’ll always be one of my favorites (the only one I’d seen before that was the badly-dubbed Fushigi Yuugi, which is much better in Japanese simply because half the time you want to shoot whoever did the voice acting for the American Miaka, and I only got about 5 episodes in even though I loved the manga to bits.) I love Chii – she is so adorable! And I haven’t been able to take these off since I made them. I’m going to be running around as a persocom for quite some time, I think :D Plus, I’m proud that the sculpts came out exactly as I wanted them. I don’t have a lot of experience with sculpties and it usually involves much gnashing of teeth and pulling of hair, but I actually had a lot of fun with these. I hope people have as much fun wearing them. :D By the way: the pictured color is the only one offered at the moment, but I’m totally open to recoloring for no extra charge. Just let me know what you need!